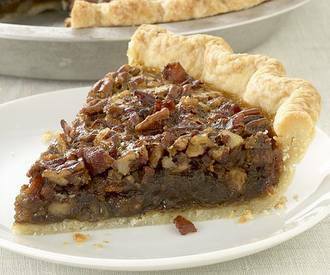 Today is National Pecan Pie Day and I have found yet another amazing recipe using our favorite food...BACON! Bacon and Cane Syrup Pecan Pie. Bacon may sound like an odd addition to pecan pie, but its salty, smoky flavor balances the sweetness of the filling in a beguiling way. Cane syrup, Louisiana’s version of maple syrup, has a rich flavor; it’s available in well-stocked grocery stores. Put the flour, sugar, and salt in a food processor and pulse to combine. Add the butter and pulse until the largest pieces are about the size of corn kernels, 8 to 12 one-second pulses. Drizzle 5 Tbs. of the ice water over the flour mixture and pulse until the mixture becomes a moist, crumbly-looking dough that holds together when squeezed in your hand, 4 to 6 pulses. If the dough is still dry, add another tablespoon or two of ice water and test again. Turn the dough out onto a clean work surface. Gently gather and press the dough into a disk. Wrap the dough in plastic and chill for at least 1 hour or up to 2 days. Let the dough sit at room temperature to soften slightly (it should be firm but not rock hard), 5 to 20 minutes, depending on how long it was chilled. Roll the dough on a lightly floured work surface with a lightly floured rolling pin until it’s about 13 inches wide and 1/8 inch thick. Roll from the center of the dough to the edges and try to use as few passes as possible to avoid overworking the dough. After every few passes, run an offset spatula or a bench knife under the dough to be sure it isn’t sticking, and give the dough a quarter turn. Reflour the work surface and rolling pin only as needed—excess flour makes the crust tough. Transfer the dough to a 9-inch pie plate by rolling it around the rolling pin and unrolling it into the plate. You can also fold the dough in half and unfold it into the plate. To fit the dough into the plate, gently lift the edges to create enough slack to line the sides without stretching the dough. Trim off all but 3/4 inch of the overhang. Roll the dough under itself to build up the edge of the crust. Crimp the edge of the crust with your fingers. With the tines of a fork, prick the crust all over. Chill for up to 1 hour in the refrigerator or about 30 minutes in the freezer. Position a rack in the center of the oven and heat the oven to 425°F. Line the piecrust with foil and fill with dried beans or pie weights. Bake for 15 minutes. Remove the foil and weights. Reduce the oven temperature to 375°F and continue baking until the bottom looks dry and the edges are golden, 5 to 7 minutes more. Cool on a rack while you prepare the filling. Reduce the oven temperature to 325°F and put a large, rimmed baking sheet on the oven rack. Put the egg yolks in a medium heatproof bowl set on a kitchen towel and add the vanilla. Combine the sugar, butter, cane syrup, cream, and salt in a 1-quart sauce-pan. Heat over medium heat just until the butter is melted and the mixture is hot but not boiling, 3 to 5 minutes. Whisking vigorously and constantly, very slowly pour the hot sugar mixture into the yolks. Strain through a fine strainer set over a 1-quart measuring cup. Pour the filling over the pecans in a slow, spiral motion; if you go too fast, the pecans may move, leaving gaps in the finished pie. Spread the pecans evenly in the piecrust. Sprinkle the crumbled bacon evenly over the pecans. Slowly pour the filling over the pecans. Put the pie on the baking sheet and bake until the center of the pie is slightly firm to the touch and the filling doesn’t wobble when the pie is nudged, 35 to 40 minutes. Let cool for at least 1 hour before serving. The pie dough may be made up to 1 month ahead; wrap it well in plastic wrap and foil and freeze it. Defrost in the refrigerator overnight before rolling it out. The pie can be made up to 1 day ahead (store covered with plastic at room temperature), but it's best eaten warm.